Super Bowl 2019 is just around the corner, but you can be sure it’s been top of mind for wireless carriers for more than a year as they work behind the scenes to make sure visitors to Atlanta, and fans at the country’s most popular sports event have the ability to call, text, live stream, and post to their heart’s content. Long before kickoff, mobile carriers work with cities and community leaders to make sure the wireless infrastructure can handle the capacity and coverage pressures when the crowds arrive to town. Dedicated teams outfit the stadium and other venues nearby with in-building, small cells, and temporary sites to meet the short-term surge in demand. Most of the infrastructure remains in place as a public benefit, providing a better network for day-to-day use as citizens move around town, and laying the foundations for the next generation of mobile technology. Here’s how it all happened in preparation for last year’s event in Minnesota. One year ago, T-Mobile was working hard to make Super Bowl LII in Minneapolis a success. The goal was excellent wireless service that allowed fans to use their mobile devices throughout the game without thinking twice about it. The people power and equipment needed were significant, but the positive impact on the city — in terms of better coverage, improved infrastructure, and positive community and economic impact — will be felt for years to come. Bringing a large-scale event to any city takes a coordinated effort. Many interested parties must come together, public and private. In the case of Super Bowl LII, it meant bringing together venue managers, law enforcement, community leaders, city and elected officials, and the Department of Homeland Security – Special Events. Now imagine bringing an event to not just one city, but two at the same time. When it was announced that Super Bowl LII would be coming to U.S. Bank Stadium in Minneapolis, Minnesota, neighboring city St. Paul also needed to be prepared for the Feb. 4, 2018, game. With the Twin Cities connected by trains, and other public services, the participation of both cities’ governments, was vital to meet the demands of game day. This put extra pressure on T-Mobile’s network teams to get everything in place by kickoff. Network infrastructure improvements included expanding the scope and upgrading the backhaul of existing sites, installing temporary sites on appropriate buildings and rooftops (including a municipal parking garage), and working with private landlords for the stadium, Target Field and the Mall of America to be sure capacity and coverage needs would be met. T-Mobile worked to hasten permitting for these large private venues, while also investing heavily in small cell technology delivered on light poles throughout both cities. The improved network is a reflection of a public-private commitment and was a significant investment by T-Mobile alone. Preparation for Super Bowl LII began in downtown Minneapolis with the installation of temporary rooftop sites more than two years before fans made it to their seats. Within 18 months of the big event, T-Mobile’s National, Regional, and local market teams led by Hossein Sepehr, Lori LeBlanc, Mick McManman, Naveen Francis, Andy Canoun, and James Cole were hard at work making sure the cities were prepared for the influx of people, attention and support brought to the region by the biggest game of the year. How’d they do it? By making connections and advocating for the needs of the public. This meant working with the Public Works departments to determine locations for small cells, then working together to navigate the permitting process. It also meant working with a representative from the Chamber of Commerce to educate city council and community members on the long-term benefits of an updated wireless network to the business community. By building these partnerships and shared goals early in the project, T-Mobile was able to expedite the permitting processes to meet deadlines. The support of local government is critical to developing wireless facilities as it allows for new infrastructure to be built and existing infrastructure to be updated. 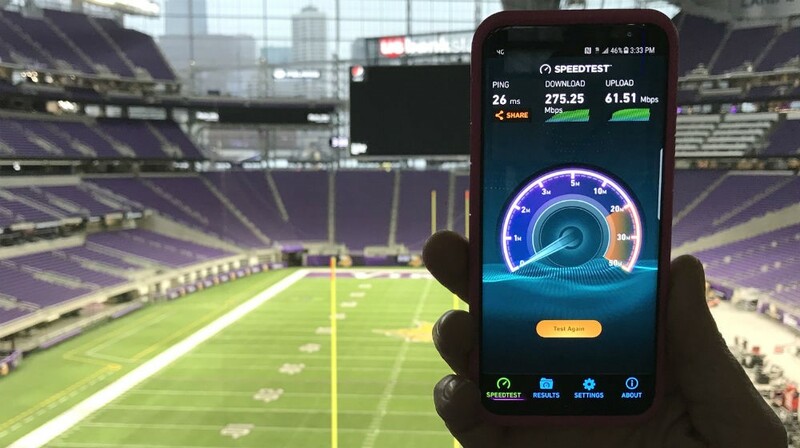 After working with the Un-carrier to get ready for the game, Minneapolis and St. Paul have been left with a more robust network to handle better coverage and capacity — including a permanent 35x increase in LTE capacity in and around key locations. At U.S. Bank Stadium, the installation of a Centralized Radio Access Network (C-RAN) means visitors will experience an increase in upload speeds of up to 40% during well-attended events. In the future, the small cells can be used to launch License Assisted Access (LAA) for even greater capacity and faster speeds. This is important since improved connectivity is essential to the next generation of wireless connectivity — 5G and the Internet of Things (IoT) — and a strong, reliable wireless network cultivates and supports economic growth and competitiveness and improves public safety. City officials in Minneapolis and St. Paul also now have a deeper understanding of wireless networks, which will help them as they make decisions about how to make their cities smarter and more efficient. Smart cities are focused on using technology to improve services, conserve resources and keep all of us moving. Investment in technology to support big events like the Super Bowl helps prepare cities for the smart city journey. Overall, meeting the demands of the Super Bowl required a collaborative effort that focused on preparation, problem solving and teamwork — with all hands-on deck as the big day neared (a little like the game itself). During kickoff, the only thing that mattered to thousands of football fans gathered inside and outside the stadium was rooting for their team and making sure they could share updates without hiccups. What mattered to T-Mobile was making sure customers had seamless service on the fastest network in the nation. On game day, we delivered. Linh Nguyen has over 15 years of experience in the wireless industry and began her wireless career working as a consultant representing clients in difficult zoning and leasing matters. She has performed work for all major wireless carriers across her telecom career and has chosen a permanent spot at the Un-carrier, T-Mobile. In Linh’s spare time she loves to draw, fly, do archery, hike and rock climb.